Please note that many of the following quotations come from written material posted publicly on the Internet, and not from firsthand interviews. Readers are encouraged to click on the over 100 citations provided throughout the article to gain further context (some may require free or paid registration). Direct quotations originate from e-mails exchanged with a company customer service representative. All corporate and court documents were pulled from the public record. Reproduced text excerpts and images on this page are used under the “fair use” doctrine, which allows for criticism, commentary, news reporting, and teaching. This is a not-for-profit fansite that does not accept outside funding or financial donations. I. Company Background explores the toy grading network’s beginnings, key officers, family and corporate connections, past controversies, and the location(s) of its facilities. II. The VGA Prototype Marketplace looks at noteworthy sales of certified video game prototypes and the role that the gaming media plays in covering them, the overall effect that the company has had on the secondary market, service-related fees, and the impact of encasing undumped games. III. VGA’s Authentication Process and Policies section examines the company’s corporate policies including its certificate of authenticity, the extent of its total video game prototype verification analysis, and the three major assurances that the service advertises. IV. Afterword goes into the author’s reason behind initiating this investigation, the concerns associated with validating video game prototypes, and company customer service difficulties. Readers are advised to finish the first section, before skipping ahead, to avoid possible confusion with the various company names and principal players. The VGA is a for-profit video game authentication and grading service. The first of its kind in the video gaming collecting world, VGA operates as a division of the Collectible Grading Authority (“CGA”), a toy grading network that includes the Action Figure Authority (“AFA”), the Die-Cast Authority (“DCA”), and the Collectible Doll Authority (“CDA”). AFA was the first of these grading enterprises, having been established as a Michigan limited liability company in 2000 by a K-9 police officer and toy collector named Charles “Chip” Ware (link). AFA began operating out of Ware’s Hudsonville home after a year of developing the designs for tamper-free toy cases. Armed with a business strategy and a set of talking points on why the toy hobby desperately needed standardized grading, Ware reached out to Tom Derby, the owner of a toy collectibles store called Cloud City, in an attempt to sell him on the service (link). Derby responded negatively to Ware’s idea, telling him how he “didn’t think it would work and that the hobby didn’t need such a system.” Derby’s toy condition descriptions were detailed and trusted; they already commanded premium prices without the need for an unnecessary outside opinion. Ware still pressed him, however, and offered to grade a large quantity of toys for Derby free of charge so that he could assess AFA for himself. Enticed by this no-strings offer, Derby finally agreed and mailed Ware a number of collectibles. When his items were returned to him, encased in clear acrylic with stickered numerical grades, Derby was reportedly so impressed that he did a complete about-face on grading. Now he wanted in (link). When AFA was incorporated in 2002, the company no longer existed in Michigan, but rather in Derby’s state of Georgia where it was sold to unnamed Atlanta area investors, according to The Atlanta Journal-Constitution (link). Ware stayed behind in Michigan where he continued his law enforcement work and later on opened a Christian mentoring non-profit from his residence (link, link). Georgia state records show that Derby acted as the company’s registered agent and an incorporator. His house in Duluth was listed as both the registered office and the principal mailing address (link). Scott Fender, Cloud City’s former Operations Manager, took on a Grader position at AFA (link, link). Rachael LeCroy, who had also previously worked at Cloud City, joined as AFA’s Customer Service Manager (link, link, link). 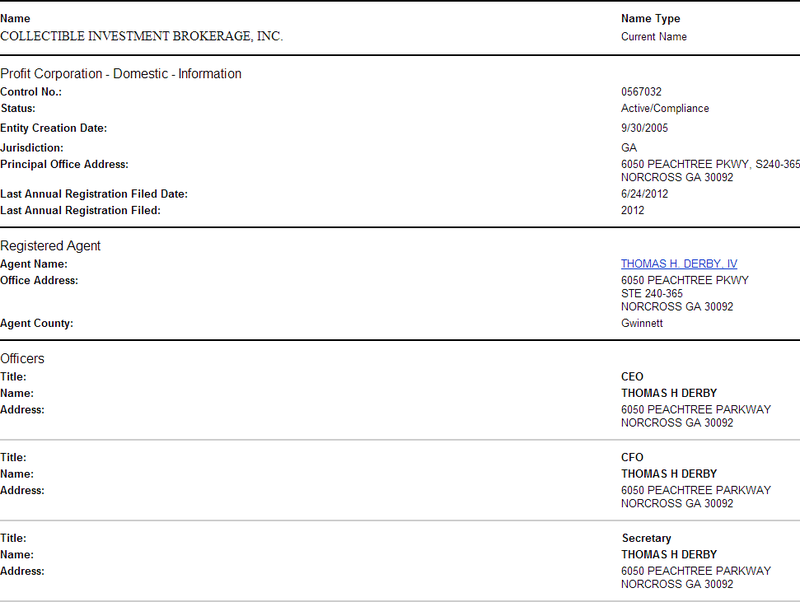 The positions of CEO, CFO, and Secretary all later went to Chad Thompson, Derby’s brother-in-law (link, link, link). Thompson became a Grader for the company as well. 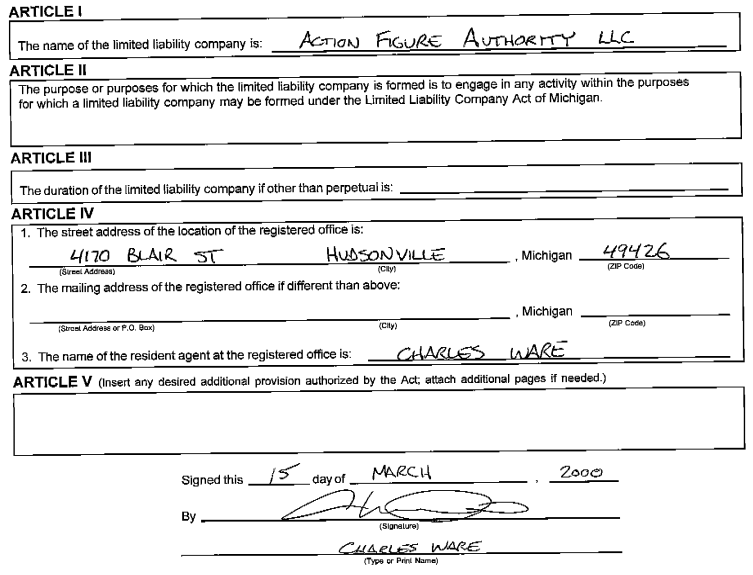 According to Georgia court documents, Thompson had filed for Chapter 7 bankruptcy protection four years prior to AFA’s move (link, link). Derby assisted in the grading company’s internal research and authentication (particularly of rare toy variants and toy prototypes) “since the beginning of AFA” (link, link). He later incorporated a separate company in 2005 called Collectible Investment Brokerage (“CIB”) to “provide authentication services for AFA” including “loose figures valued at over $200, [Double-Telescoping Lightsaber] figures, [Vinyl Caped] Jawas, and virtually anything pre-production” while simultaneously acting as a broker for CIB (link, link, link, link, link). In addition to offering his verification services, he would also supply the toy cases to AFA (link). In 2003, Derby opened a web store called ToyCases.com as a division of Cloud City that sold “custom acrylic cases” that “look nearly identical to the AFA style cases, but have a sliding bottom” (link). 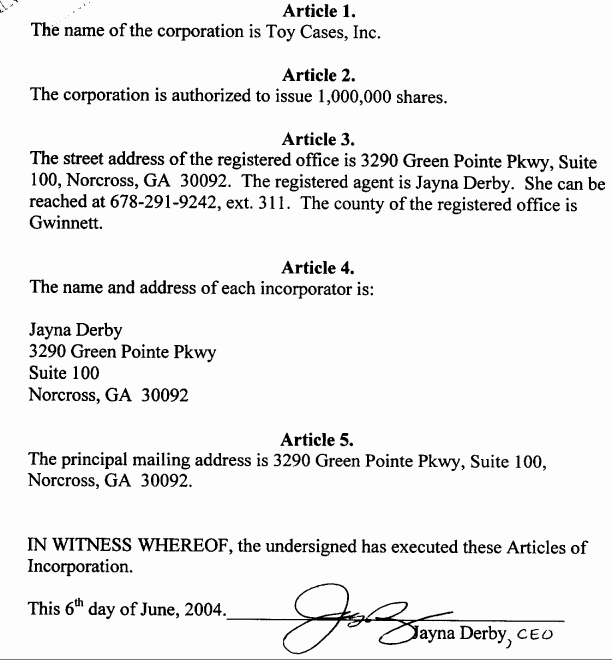 State records show that Toy Cases was incorporated in June 2004 by Derby’s sister, Jayna, who is also Thompson’s wife. In August 2004, another company called Anything Acrylic was incorporated by her and Derby (link, link). A year later, it was announced that AFA’s parent company, CGA, had purchased Toy Cases and now employed the “same craftsman” (link). In 2009, as part of an online webcast series that explored the challenges small business owners face, SunTrust Banks uploaded a five-minute clip on YouTube called “SunTrust Visits Collectible Grading Authority: Streamlining a Business Model.” During the program, Derby talked about having to “cut our staff levels down and have people multitask and be responsible for more.” To compensate for the fewer employees, Derby confessed that he usually worked “until about midnight or one in the morning each morning.” In order for the company to stay profitable, Derby said that “we’ve expanded the type of services we offer to incorporate a much larger base to pool from,” possibly hinting at the creation of VGA one year prior (link, link). Outside of the video, he identified himself as a CGA “shareholder” and a “strategic analyst” who sits on the “Board of Directors” and does not receive a salary (link). 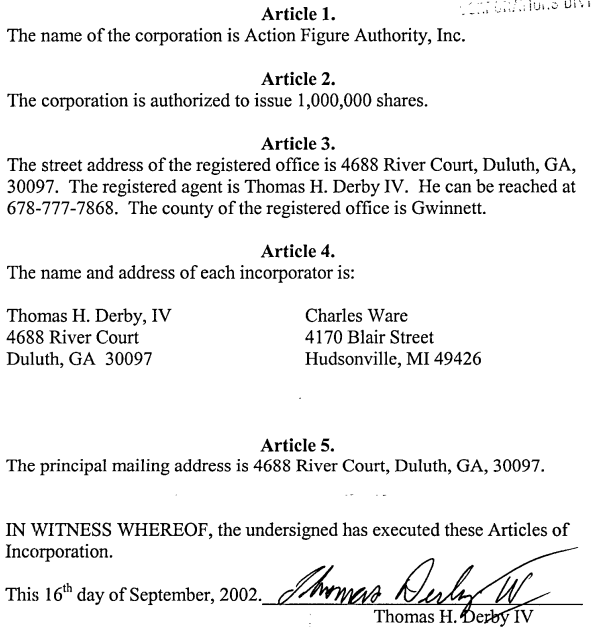 In 2007, Derby also stated that he directed the “marketing worldwide for all the CGA companies” (link). In 2003, though, Derby tried to distance himself from AFA. “Employees of Cloud City don’t own stock in AFA and employees of AFA (or AFA itself) don’t own stock in Cloud City. The connection is not as close as you imply. Both companies are under completely separate ownership and neither company owns a piece of the other,” Derby said at that time (link). His remarks were addressed to Star Wars collectors upset at seeing what they believed was a a violation of the grading company’s third-party impartiality in Derby’s Cloud City selling close to a thousand high-graded AFA toys at a time on eBay (link, link). When he still owned Cloud City and his store did stock AFA toys, Derby initially refused to answer whether he had any financial ties to the grading service (link). “Whether or not I, Tom Derby, own any shares of stock in AFA is personal information,” he said. “I feel that this is the same as asking me to post a list of what stocks I hold in investment accounts here for public viewing. If I did own shares of stock in AFA and Cloud City had figures graded [there], it would be about as much of a conflict of interest as me owning shares of stock in IBM and Cloud City buying an IBM laptop computer” (link). The About Us page from AFA’s website made it clear that “AFA’s employees will never buy or sell AFA graded action figures” for the company felt “this would be a conflict of interest and [it would be] impossible to maintain our unbiased approach” (link). Derby appeared to agree, in spite of his previous IBM computer analogy, but insisted that there was no issue because he did not have a stake in AFA. “I can assure you that Cloud City does not own any fraction of any percent of AFA. This would be a major conflict of interest and is simply not the case… The two companies are separate and neither one owns any portion of the other,” he said (link). Mrs. Derby-Thompson then entered the conversation, publicly designating herself as Cloud City’s “CEO and COO” (link). 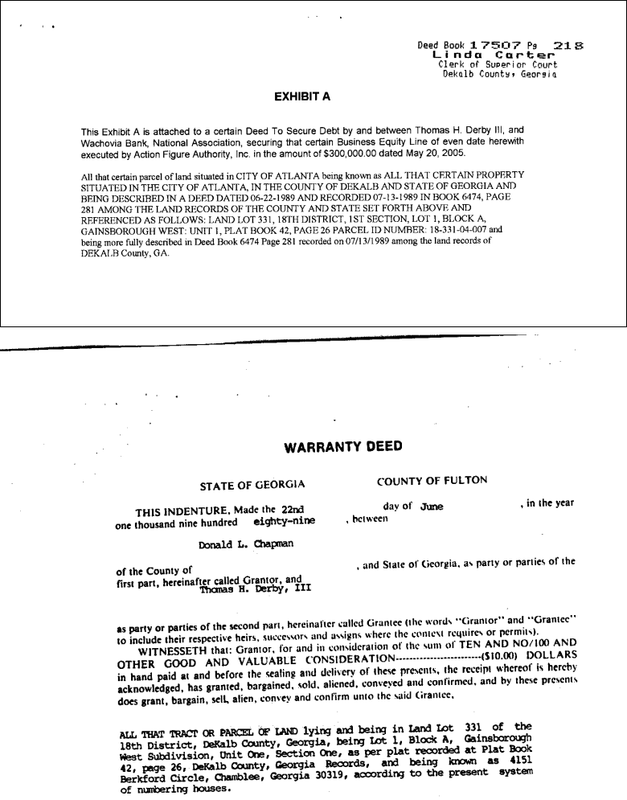 Georgia state records show that she and her brother have gotten into a wide range of other business ventures together. In 2002 alone, new filings had her listed as Secretary of Abacus Credit Counseling Inc., Hire A Nerd Inc., and Reliable Components Inc. while Derby was CEO and CFO of those three companies, all of which have since been administratively dissolved (link). As the first major retailer to adopt the AFA system, Cloud City’s mass listings of graded toys arguably popularized the service, leading other dealers and individual collectors to follow suit. By 2006, CGA reported that it was evaluating 50,000 toys annually, the lion’s share of which were going to its flagship company, AFA (link). Derby announced that he sold his ownership of Cloud City in 2005 (link). In May of that year, a business equity line was taken out by AFA in the amount of $300,000. A residence owned by Derby’s father at 4151 Berkford Circle in Northeast Atlanta’s Dekalb County was used as collateral (link). That address matched the one seen in Cloud City’s domain registration circa 2007 as well as on multiple public business listing sites like YellowPages and Yelp (link, link, link). Now severed from Cloud City, Derby said in 2007, “I will once again go on record to say that I have no ownership in Cloud City Collectibles. I will also go on record to say that I do now have ownership in AFA” (link). Soon after Derby parted ways with his store, Cloud City’s website began directing customers to the Wisconsin-based toy retailer Brian’s Toys (link, link). Brian’s Toys eventually absorbed all of Cloud City by early 2008 (link). Brian’s Toys had been a client of Derby’s CIB and was also a onetime exclusive wholesale purchaser of his sliding bottom toy cases (link, link). The owner of Brian’s Toys, Brian Semling, and Derby announced that same year that the two would be co-running the Premier Collectible Auctions (link). The summer auction catalog consisted of several hundred AFA, DCA, CDA, and VGA-graded items, including lots authenticated and signed off by CIB, estimated to be worth over $2 million dollars (link, link). Derby was given the title “Director of Procurement” and gave his “endorsement” of the auction (link, link). “Since the emergence of industry standard third party grading and conservation services eight years ago, the action figure toy market has seen higher quality toys often increasing in value by ten-fold or more,” states the catalog. “Since video game grading has only just begun to be offered, we would expect a similar rise in their market value, especially for rarer titles in premium condition, as both collecting demographic and the investment-friendly ration of supply vs. demand for video games seem to parallel the collectible toy market” (link). The idea for VGA dated back to at least its VGGrader.com domain registration almost exactly one year before the auction was held, June 28, 2007 (link). Video game grading was not the only expansion that CGA had on its mind at the time. According to public Whois records, on the same day, the company also secured the URLs NonSportsCardGrader.com, NonSportsGrader.com, MoviePosterGrader.com, PosterGrader.com, PEZGrader.com, and LunchBoxGrader.com (link, link, link, link, link, link). Prior to that, CGA parked the name ComicBookGrader.com in 2005 (link). In 2010, Derby revealed that he had played an early pivotal role in VGA’s sealed game grading process. “Over the past few years, I’ve gone to great lengths to develop new techniques and record new observations about the general nature of multiple types of seals… I’ve conducted extensive research for several years into reseal detection methods as well as known methods used to recreate cellophane seals around games which have been previously opened,” he said. “I’ve worked with the most knowledgeable collectors in the sealed video game hobby to gather specific types of expertise from each. I’ve consolidated this information and discovered a great deal of information on my own, all of which has been recorded and used to assist in training VGA’s top Graders” (link). 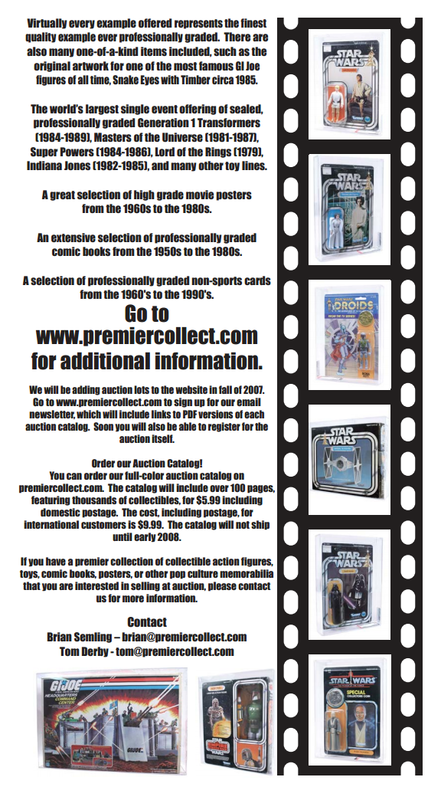 Premier Collectibles Auctions was first incorporated in the same month as VGA’s debut, February of 2008 (link, link). Before VGA’s public launch, Brian’s Toys was observed actively seeking out and acquiring hundreds of sealed video games, which, after being graded, were then stocked in its new e-commerce store called Premier Video Games (link, link, link). Whether or not a true conflict of interest could be pinned on Derby remained up for debate, but his complicated connections and oblique statements did not sit well with some collectors, who felt at the very least there was the appearance of impropriety. Their suspicions, coupled with growing outrage over the perception that AFA grades were artificially inflating toy prices for all collectors, took a toll on Derby well before the creation of VGA or the airing of the SunTrust video. The commonplace attacks at one point even forced him to announce his departure from one of the most frequented Star Wars forums on the Internet, where he was a regular. “I have never behaved dishonestly, nor have I ever showed favoritism related to authentication and grading,” he said in 2007. “In addition, I have always helped virtually everyone who has ever asked for my assistance. I have enough stress in my life without coming to these forums to listen to the select few people who choose to not only point out what they believe are mistakes, but also to make mean-spirited comments about the level of honesty and integrity that I (and AFA) hold dear” (link). In September 2010, Derby stated that he would soon “no longer be focused on AFA projects” after fulfilling “obligations to oversee the final development of their new website…, customer service, and a knowledgebase.” He had drastically cut down his hours, from working “almost every day at AFA” between 2008 and early 2010, compiling computer information so that “advanced variation and technical data will be easily available to AFA’s Graders” to now only assisting at “an average of five hours per week.” Despite his public 2007 admission that he was an owner of AFA, Derby continued to refer to himself as an “outside contractor” for the company. “With that said, I’d ask that you please refer to me by my actual name and refer to the company Action Figure Authority as AFA,” he said (link). The SunTrust video provided most people–regular customers included–their first glimpse into the toy grading network’s actual facilities. The reason being that collectibles mailed to one of CGA’s various grading services are sent to what the company calls its “holding facility,” a UPS Store mailbox located in Roswell, Georgia, a suburb of Atlanta. CGA keeps its real location a secret for “security purposes.” According to Georgia state records, the company’s public address before Roswell was another UPS Store located in the same city as the home Derby lived in at the time of AFA’s incorporation (link, link). 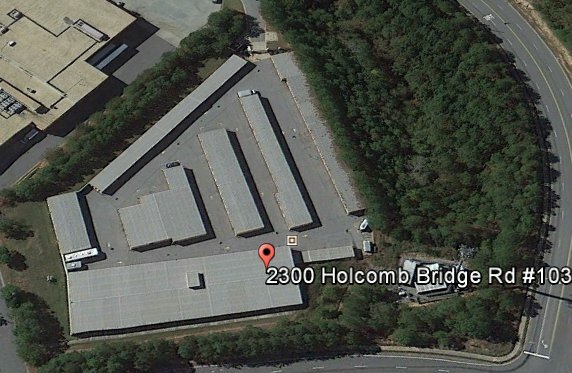 While writing this article, the CGA website shows that the company has changed addresses once again and now currently lists a new location nine miles away from Roswell in a Norcross industrial park on Peachtree Industrial Boulevard (link). 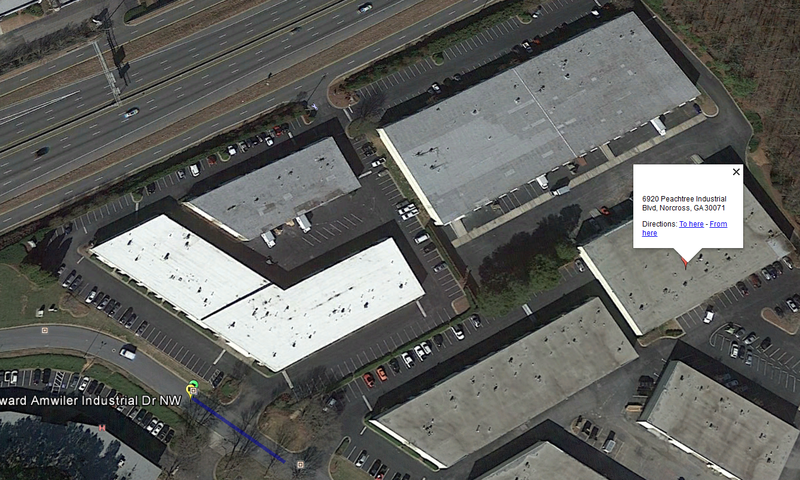 CGA’s Peachtree Industrial address is a mere 135 feet away from Cloud City’s former industrial park office space (link). According to a building permit obtained from the Gwinnett County Department of Planning and Development, an estimated $750 of racking services were provided to AFA at that address in 2005 (link). Derby described CGA’s building as consisting of 10,000 square feet, complete with an “acrylic fabrication factory” and a sectioned-off “grading lab” (link). Star Wars and video game collector Steve “Orrimarrko” Molloy had a chance to set foot in one of the company’s work locations. He was visiting Derby’s home in or around 2004 to see what one-of-a-kind toy items were for sale when the opportunity arose. Thompson explained to The Atlanta Journal-Constitution in 2005 that all the secrecy was a requirement of the company’s insurance policy. “Nobody knows where we’re at,” Thompson told the newspaper. “The toys are not in a vault, but it is a secure building at a discreet location” (link). Although VGA accepts submissions of all types of video game paraphernalia, from accessories to systems and other gaming-related merchandise, the company’s evaluation of unopened sealed video games seems to be its biggest draw for collectors and dealers. After a game item’s condition is reviewed, VGA assigns a numerical grade based on a 10 (“Very Poor”) to 100 (“Gem Mint”) scale, then seals the piece in a hard acrylic case. VGA emphasizes that this system of safekeeping ensures the contents inside “will not be touched by human hands,” thus preventing a degradation of the graded rating or any doubts of the item’s authenticity. The “slab,” as it is often unofficially called, cannot be tampered with “without [the cases] being broken open” (link). While VGA has catered to buyers and sellers of shrinkwrapped video games since 2008, the company has only relatively recently ventured into the realm of game software prototypes. According to one AFA dealer who spoke with Derby over the telephone, the company had future plans to begin authenticating video game prototypes with the aid of an expert in 2010 (link). 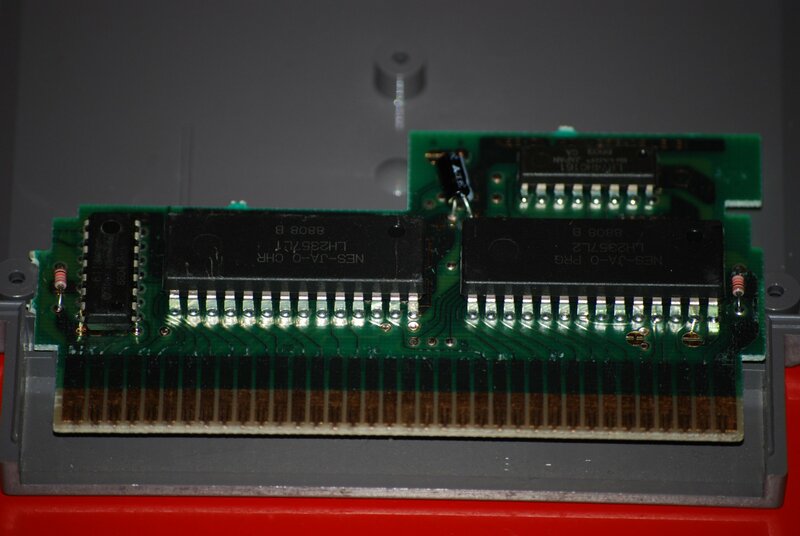 Two years later, in August 2012, the first instance of a VGA-authenticated prototype appeared on eBay, the unreleased Arcadia VI for the Nintendo Entertainment System. Rather than issuing a grade on a possibly one-off game, as VGA was reportedly prepared to do since AFA has a history of giving out grades to pre-production toys, the cartridge’s owner, a well-known Massachusetts prototype collector and seller by the name of Mark Nolan, opted to go with a “No Grade” rating instead (link). Nolan’s auction cited the VGA certification and the growing popularity of video game collecting as reasons for investing in a verified prototype. “If our word isn’t good enough, take the word of the premier Video Game grading and authenticating company,” he wrote in the auction’s description. Nolan went on to further explain in a forum post, “VGA putting their reputation on the line for this and any other game they grade gives buyers peace of mind and nets sellers thousands of extra dollars. When it comes to this hobby, the only thing I like more than historical preservation is making Gorillions. VGA helps me do that. Some people hate hearing it, but it’s a reality of where the hobby has gone” (link). 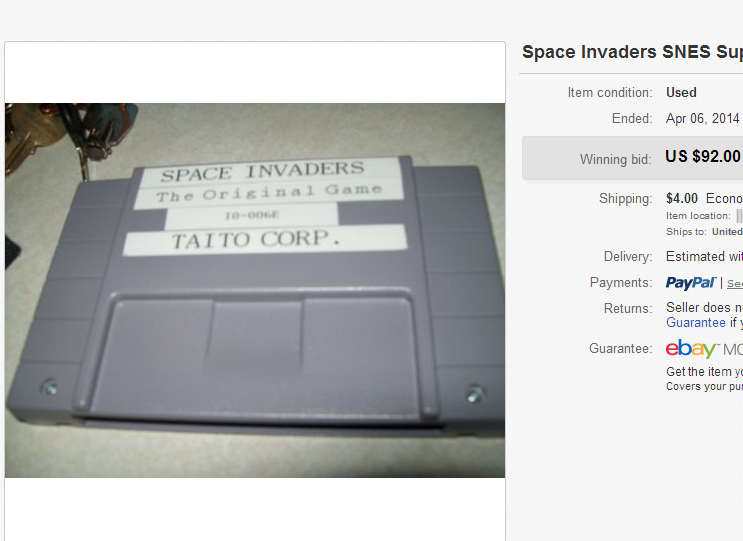 Though the cartridge was first listed at $100,000 (or best offer), it brought in less than a hundredth of that price in an open auction in June 2013–$810. Nolan originally purchased the prototype for $1,500 before selflessly making the game’s binary available to the public, an act that almost always significantly lowers a prototype’s perceived monetary value (link, link). 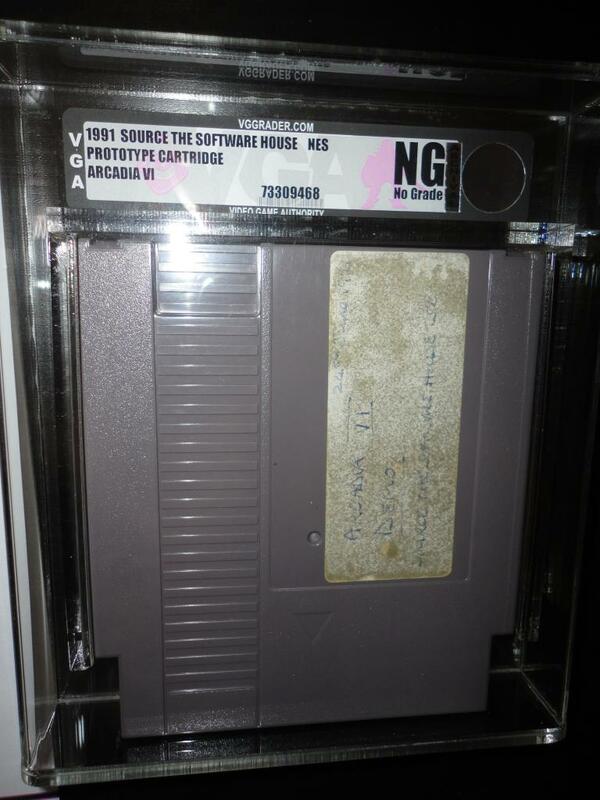 Nolan had more success in the following month when he placed an Earthbound Super Nintendo pre-release cartridge on eBay for $15,000 (or best offer). Former Gawker reporter Owen Good, who has since moved on to Vox Media’s Polygon, covered the auction on the heavily trafficked gaming blog Kotaku. In his brief three paragraph write-up, Good did not critically explore VGA’s authentication role or question the terminological validity of calling the cartridge a “prototype,” taking instead the outside authentication and item description at face value (link). One of the tens of thousands of readers of Good’s post was a store owner by the name of Paul Clavet. “I didn’t even know such a thing existed until I saw a news story about the auction,” Clavet said (link). He subsequently submitted an offer of $5,000, an amount largely unheard of for a Super Nintendo prototype, let alone one that almost surely contained the same code as the released game given the word “final” on its front label. Clavet believed his offer would not be enough to sway the seller (link). To his surprise, Nolan accepted. “I bought the game primarily to resell,” Clavet said afterwards (link). 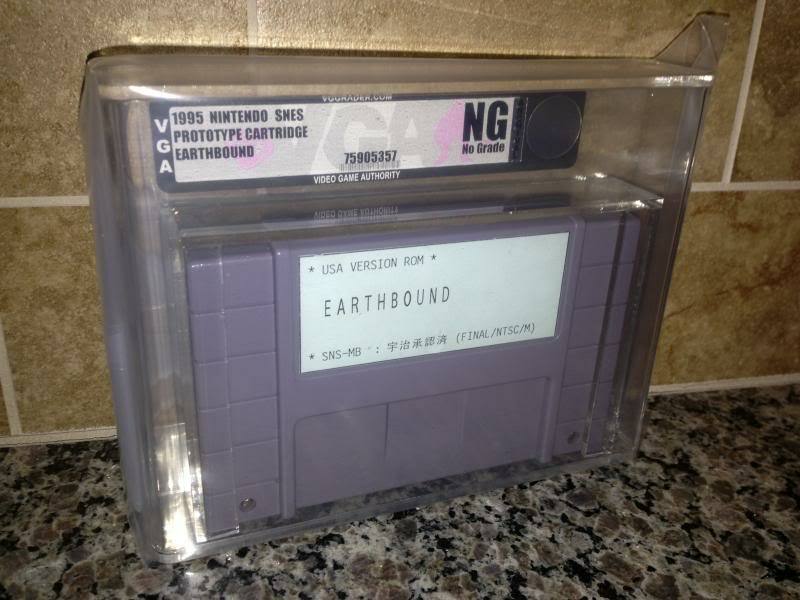 Although Good parroted the auction’s words in calling the Earthbound cartridge a “one-of-a-kind item” on Kotaku, leaving off the fact that Nolan also stated that there were a “few” others out there, further probing uncovered at least four identical examples residing in private game collections (link, link, link, link). Nolan, alone, had acquired two copies. His were originally found in Europe, along with several other samples and prototypes, a few months prior (link). 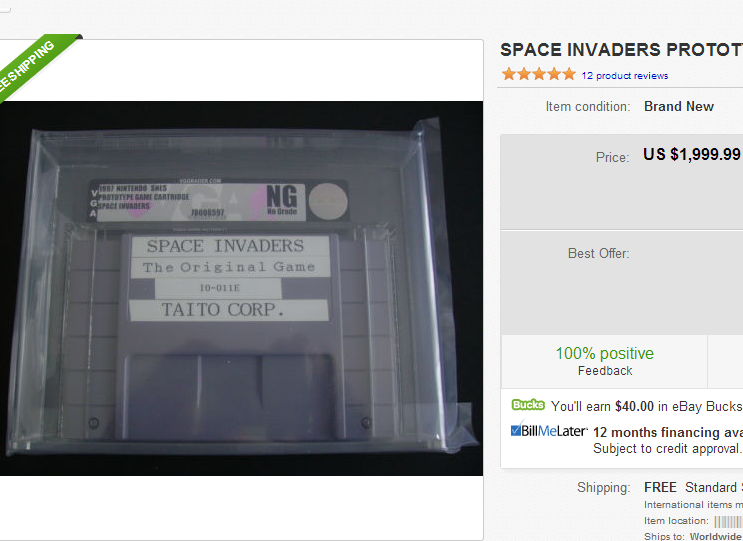 According to their former owner, who goes by the online handle “Nighty,” Nolan paid $1,400 apiece for the two Earthbound cartridges before handing them over to VGA. 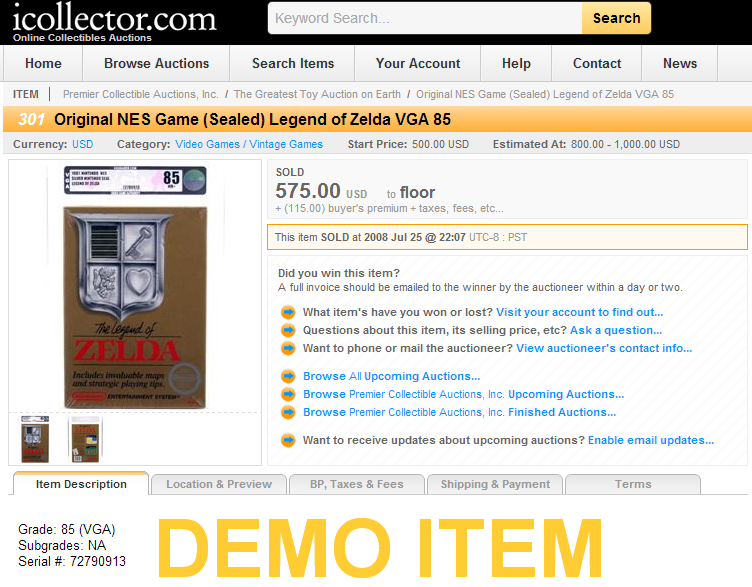 One could argue that the media exposure proved to be more of a factor in raising the Earthbound auction’s profile than any confidence gained from VGA’s authentication, as Clavet immediately removed the cartridge from its slab upon receiving the game (link). 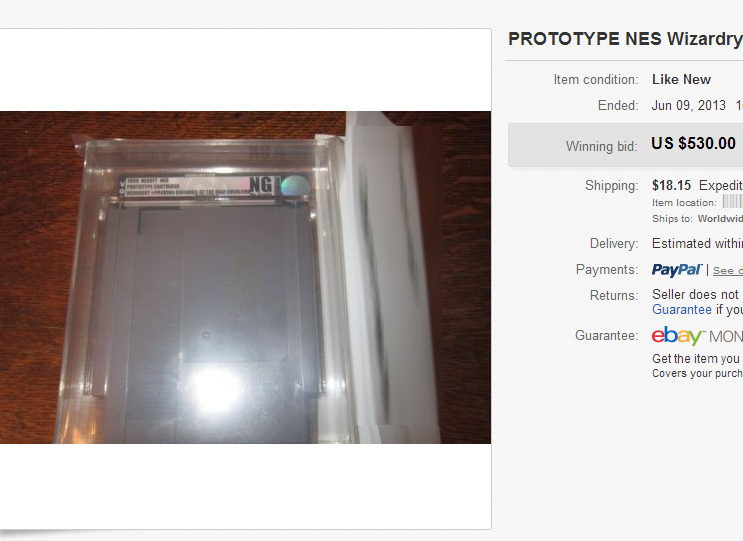 About a week later, though, Nolan listed his second VGA Earthbound sample with a .99 starting price, and the bidding ended at a still very respectable $3,377.98 without garnering any major press coverage. All told, the two combined sales netted Nolan a profit of over $5,000, attesting either to the potential power of VGA or the unique rabidness of the Earthbound fan community. 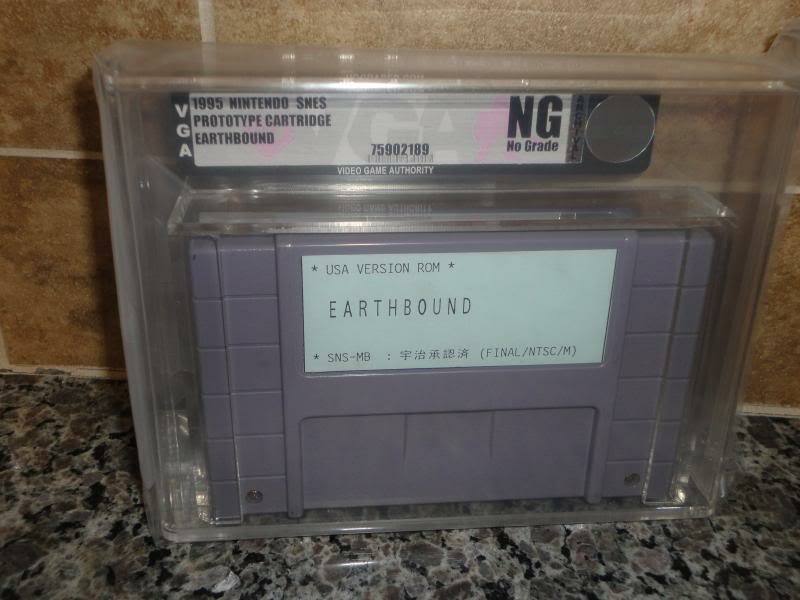 The second Earthbound also appeared to wind up in the hands of another reseller, as it was placed back on eBay two months later with a $7,500 Buy-It-Now, and then relisted twice with a starting bid of $3,499.99. The auction(s) closed without any bids. Clavet’s copy–and torn open VGA case–reappeared for sale on eBay in April 2014, back once again at $15,000 (or best offer). 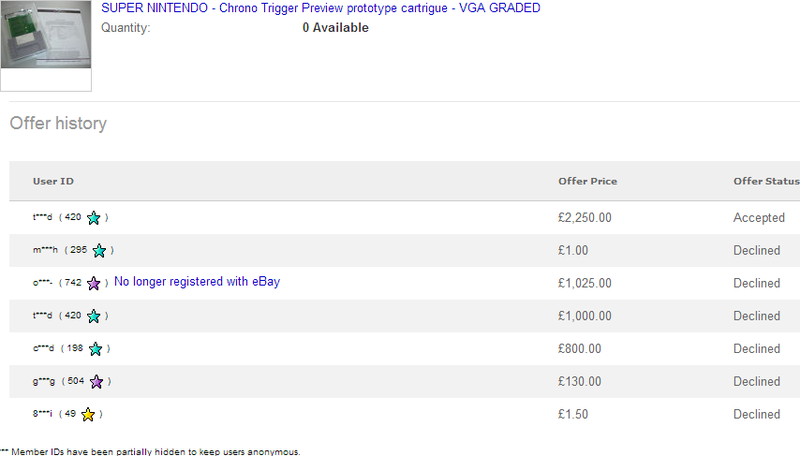 Some other notable VGA auctions include a Chrono Trigger preview cartridge that sold in March 2013 for £2,250 (regarded as one of the greatest video games from the 16-bit era, this price was nevertheless unusually high for a Super Nintendo preview copy); a Wizardry: Proving Grounds of the Mad Overlord Nintendo Entertainment System prototype that commanded $530 in June 2013 (it is estimated that a non-VGA original Nintendo prototype in the Wizardry series would bring around $250 based on offers received from a previous public sale [link]); and a Double Dragon II prototype that brought in $1,025 in May 2013 (Nintendo Entertainment System prototypes from the iconic Double Dragon series do not come up for sale often, but a development cartridge of the original Double Dragon was listed back in 2008 for $375 [link]). The Chrono Trigger buyer, who has an eBay feedback score of 433, gave the seller this compliment: “Excellent Item for a good price!!! !” The seller of the Wizardry and Double Dragon II prototypes left both buyers positive feedback, signifying that the transactions were successfully completed. As a marketing strategy to maximize a seller’s earnings, these sales favored VGA. Overall, however, there does not exist enough market data to make a clear determination on whether the claim that VGA-authenticated prototypes sell for more holds water. It is important to calculate in VGA’s service-related fees. All submitted video game prototypes fall under the company’s Qualified Grading Scale Archival Custom Size tier (“V-QC1-A”), which, as of June 2014, costs $80 (link). VGA charges an additional $50 for a certificate of authenticity to be included (link). This $130 total does not include shipping and insurance costs. 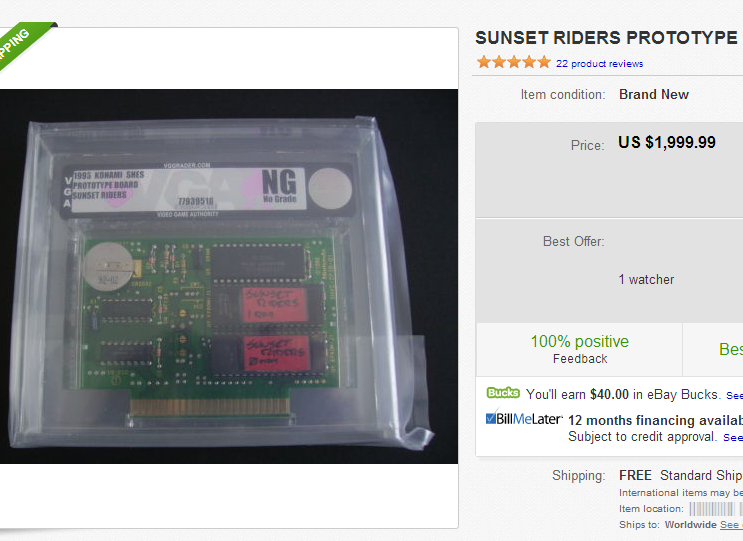 Though prototype pricing can sometimes fluctuate, a quick search of recently sold auctions on eBay yielded two non-VGA Super Nintendo pre-release games ending at around the same as or less than the company’s service fees: $92.00 for Space Invaders and $134.22 for Sunset Riders. These specific listings were singled out to compare with two VGA-certified samples of the same games currently listed in an eBay Store for $1,999.99 (or best offer) each. The same complaint that toy collectors had of how several AFA-graded items simply stagnate in eBay Stores at prices many times over their going rate (and grading service costs) appeared to also ring true for VGA prototypes. There does not appear to be any evidence to suggest that the grading company has had an effect on increasing the prices of non-VGA prototypes, either. 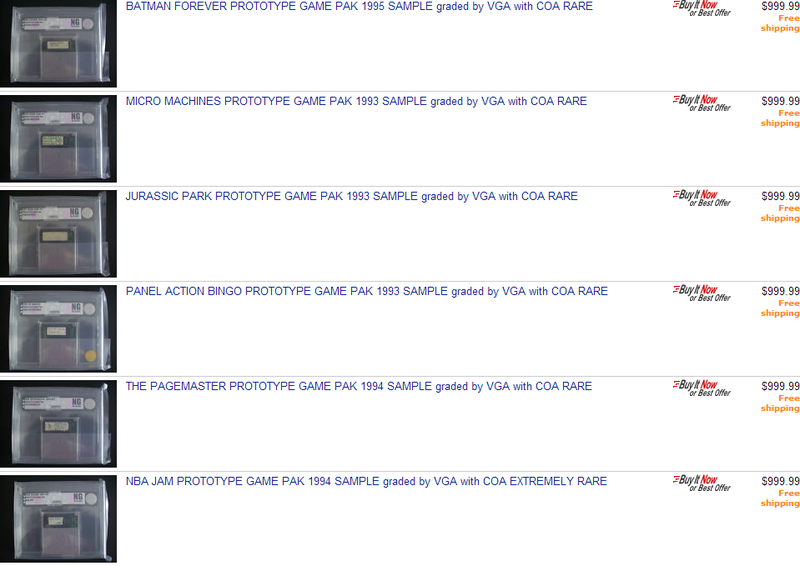 As of this writing, 13 VGA pre-release games are listed in eBay Stores. Of these, the least expensive ones–various Game Boy prototypes of lower quality titles like Panel Action Bingo, The Pagemaster, and Batman Forever–are priced at $999.99 (or best offer). In a 2011 interview with Figures.com, Thompson was asked if he had seen a positive or negative change in the way that toys are sold on the secondary market as a result of AFA’s business model. While it may be true that the company has “nothing to do” with the prices buyers will pay, it nonetheless promises sellers bigger returns in its FAQ, stating as a benefit that “graded items will normally sell for much higher prices than un-graded items” (link). Additionally, Derby spoke to this in the SunTrust video: “…we basically have designed a custom acrylic display case and we assign it a grade and we permanently seal it in that display case to both preserve it and increase the value by having an official grade assigned” (link). Thompson suggested that jealousy from cash-strapped shoppers may be to blame for the bitter attitudes directed toward his grading company. He closed his answer by again addressing the negativity. “The majority of bad press out there includes completely false assertions about AFA which are based solely on negative emotions of a few individuals who choose to completely ignore actual facts about our company” (link). 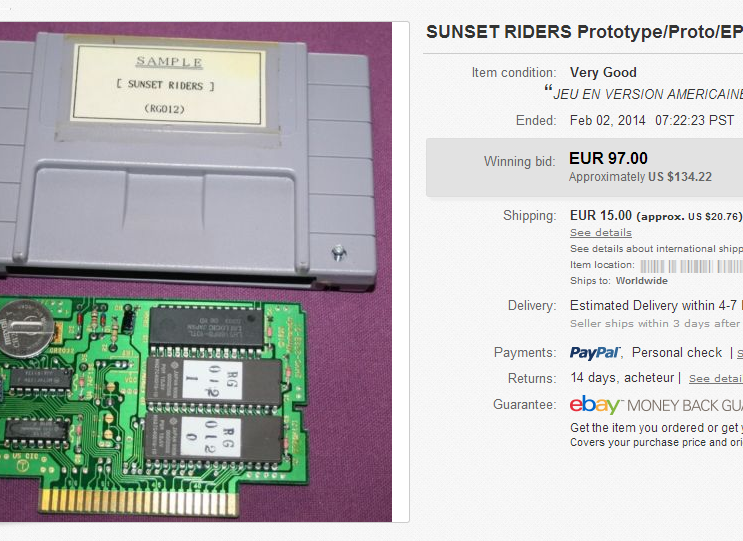 Although a large number of the VGA sample and prototype cartridges that have been on eBay thus far contained likely retail code or binaries made public years ago, some seemingly un-backed-up slabbed betas, with possible data differences, have also surfaced. One such game was a prototype of the cult hit Harvest Moon for the Super Nintendo. In the case of Harvest Moon, Jason “DreamTR” Wilson, the purveyor of one of the largest recorded private video game prototype collections in the world, had attempted for at least three years to actively sell the game at prices between $800 to $1,250 (link, link, link, link). Unable to find a buyer, Wilson sweetened the deal by throwing in an unreleased Electronic Arts action title called Eurit and asking $1,000 for both (link, link). Within a couple of days, his plan worked, and the two games were sold. The now VGA-encased Harvest Moon no longer sits on Wilson’s shelf or in one of his many crowded game bins, but on eBay at $4,995 (or best offer), where it has remained for six months–unsold. 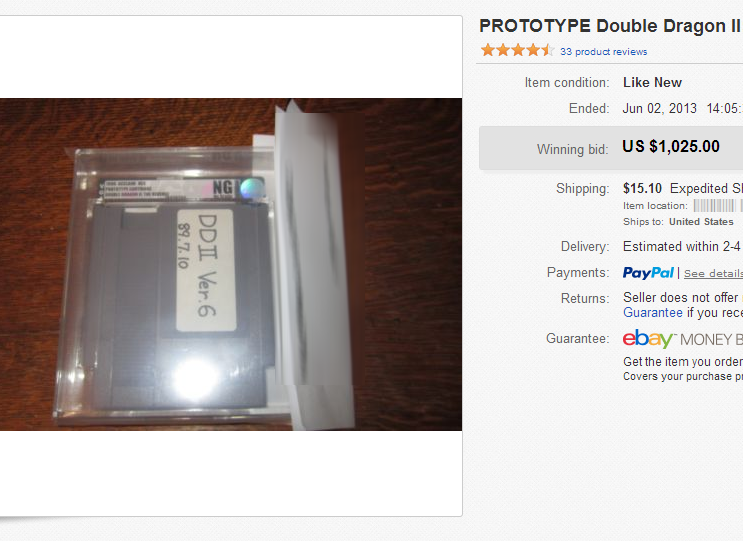 Also not dumped is a $37,500 (or best offer) Trog Nintendo Entertainment System prototype, and its eBay seller does not hide this fact in his auction description. It is not a stretch of the imagination to assume that this was mentioned to highlight how undumped prototypes typically command more money. The rather unorthodox sales presentation caused an uproar among some preservation-minded collectors who pointed to the irresponsibility of the seller and warned that such a business tactic could begin to set a precedent for more historically important undumped prototypes in the future (link). This concern was especially directed to prototypes, such as Trog, that have their program code and graphics stored temporarily on erasable, light-sensitive chips called EPROMs. 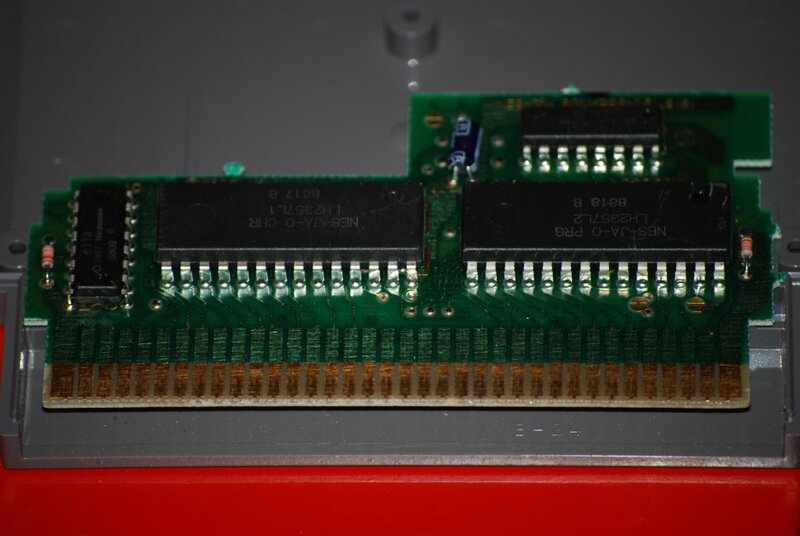 At an additional expense, VGA placed Trog in a larger than normal case so that the circuit board could be displayed beside the cartridge. While the auction stressed that the data “will not be affected” on account of the UV-resistant acrylic display case, it did not address the fact that, even under the best conditions, the electrons, injected into the EPROMs, will inevitably dissipate over time, taking with them the game information, and leaving the chips blank. 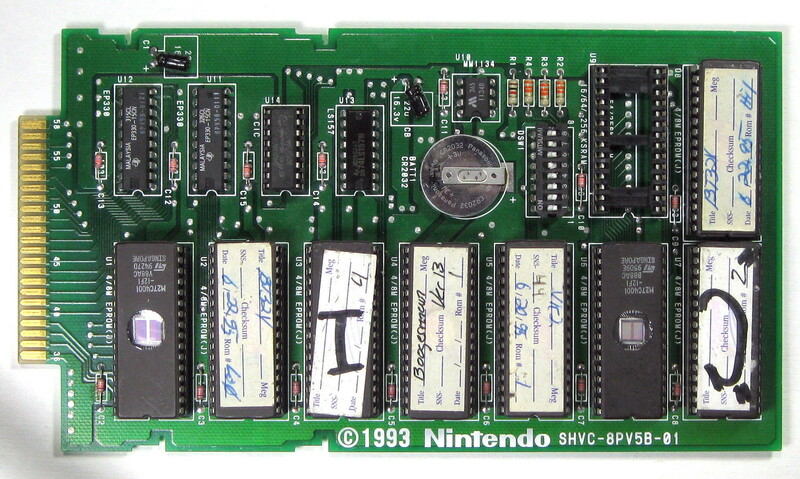 This presented a quandary to video game prototype enthusiasts: If these chips were left untouched, then their unsaved game data risked being erased over time and forever lost, but if the game were removed from the sealed acrylic case, then the VGA certification would be rendered useless and a waste of money. This careful wording makes it clear that VGA will not be held legally or financially responsible for any wrong certifications or for negligence on its part. The piece of paper comes without an obligation to reimburse the owner, partially or fully, should the item turn out to be not as advertised. By comparison, Collectors Universe Inc., the parent company of PCGS and PSA/DNA, two leading grading services of coins and trading cards, respectively, has a cash-back policy in place in the event that a certified item is later found to be fraudulent. According to its Financial Guarantee of Grade & Authenticity pages, should a submitted piece “be misattributed, non-authentic” or “fail… authenticity standards” the company “shall pay the current market value… at the originally assigned grade” (link, link). These guarantees are selective, though, as PSA/DNA does not provide refunds for sports memorabilia or autographs. CGC, the prevailing comic book grading company, also “guarantees that a comic book encapsulated in a CGC holder is authentic” (link). A representative at the company confirmed that a full refund would be issued. “The VGA guarantee is therefore in place to compensate collectors for clear mistakes,” he said, “and to further ensure that VGA collectors are happy with the products they receive” (link). This “guarantee” refund policy is not found on VGA’s certificate of authenticity nor is it contained on any parts of its website, however. When someone performed an experiment to see if a resealed Star Wars figure would slip by AFA in 2002, and it did, a Master Grader publicly announced that a full refund would be issued for the company’s mistake (link). However, in December 2013, a far more widespread reseal operation came to light. A major German dealer named Antoni “Toy Toni” Emchowicz was alleged to have purchased over 11,000 rejected European Star Wars cardbacks as well as six boxes of unused action figure blister packs after a toy factory closed, according to handwritten inventory documents from his now deceased business associate. It was discovered that Emchowicz allegedly kept a second eBay account, which changed usernames 30 times, to purchase corresponding loose action figures under the radar, although this could not be confirmed after the profile was made private. He allegedly attached the blister packs to the cardbacks with the figures inside using an ironing heat seal technique to create counterfeit “mint on card” examples. AFA population reports show that the company had evaluated hundreds of these suspected types of figures over the years. Emchowicz, a longtime AFA customer, appeared to have successfully had his alleged assembled imitations graded as authentic original sealed toys (link, link, link, link). The popular Star Wars collecting hub Rebelscum.com reported on its news page that “a lot of collectors are quickly dumping their figures in forums and on eBay in hopes to save their investments before this fiasco becomes front page news (as it just has). If what we are hearing is true, these fakes are so good they have even fooled AFA” (link). AFA was at first unwilling to release a public statement on the “Tonigate” scandal. A company customer service representative named “Kim” gave a canned reply to one Star Wars collector’s frantic e-mail inquiry. “Thank you for contacting us. We are aware of the posts. Unfortunately, we cannot make a statement based on speculations in a forum. Happy Holidays” (link). 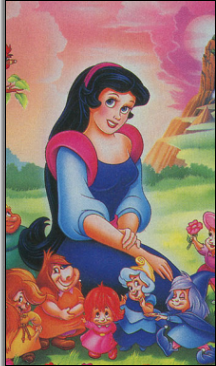 AFA defines “Qualified” in part as “opened package toys with new content” (link). “I thought the prices were decent and that they would be a good long term investment,” he said. “While that is still possible, it seems less likely than a significant loss in value” (link). Thompson finally acknowledged the situation in early January. His official company response was to “put a freeze on the processing/grading of any card variations in question,” “get a programmer to make alterations to the AFA website… to add a disclaimer to every serial number associated with questionable European card variations within the free online serial number verification database,” and ban Emchowicz from ever submitting items to AFA again (link). There was no mention of reimbursing any of the collectors who now viewed their affected AFA-graded toys as forgeries. VGA also claimed it has a number of prototype expert contacts outside of the company that it calls upon. “We have multiple contacts with experts in this field that we reach out to in order to assist us in discovering the history of a given item,” VGA said. Wilson, however, denied having any dealings with VGA. 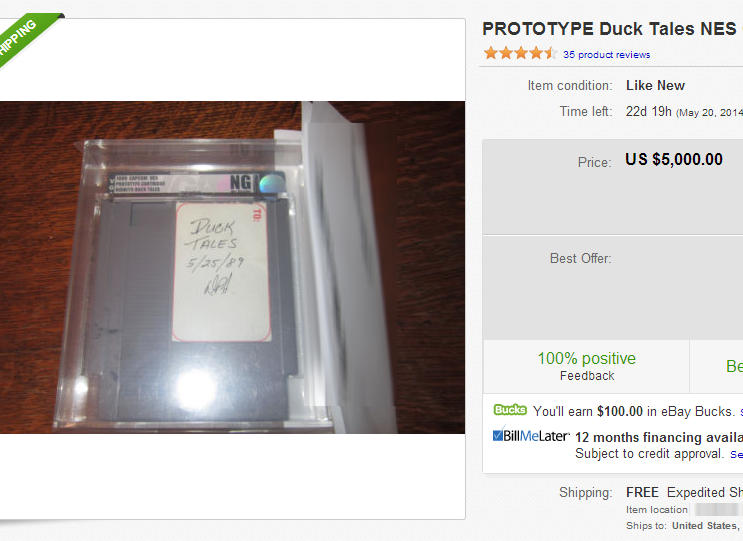 He said that he had sold those prototypes directly to the eBay seller, who then in turn had them sent to VGA. According to Wilson, this dealer claimed that VGA “might” reach out to him during its authentication process. “They told him they would I am sure,” Wilson said. “Maybe the Nolans don’t talk to them either,” Wilson joked. Nolan expressed disinterest in participating in this article, so his involvement with the company’s prototype verification examinations is unknown, but his twin brother, Matt, has said in the past that “there was a time where Mark and I were actually talking to VGA about acting as prototype specialist, but it never amounted to anything” (link). Nolan also said publicly that the two “do not work for VGA and have never been paid or given incentives/discounts” (link). Other Ocean Interactive designer, Lost Levels webmaster, and game historian Frank “TheRedEye” Cifaldi was asked if VGA has ever requested his input on reviewing any prototypes before. “I’ve never been contacted by them, no,” Cifaldi said. Nielsen also has never heard from the company. Nielsen maintains one of the Internet’s largest databases of Nintendo Entertainment System and Nintendo 64 prototypes. The webmaster of Hidden Palace, Luke “drx” Zapart, who specializes in SEGA prototypes, never spoke to the company, either. 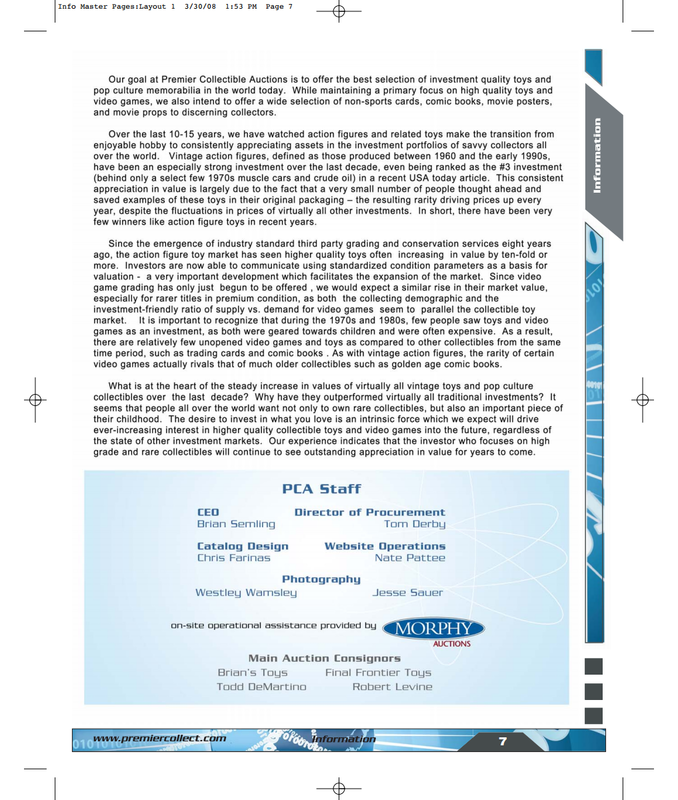 On the Submission Instructions page of VGA’s website, under the section entitled “For select Pre-Production, Prototype & Hand-made Action Figures & Video Games,” the company does not list any recognized video game collectors, dealers, or industry members as its outside consultants but rather Derby’s toy brokerage company: “provided items of this type can be verified as authentic via outside authentication by CIB” (link). While claiming to offer “outside authentication,” Derby’s CIB office was, if not still is, located inside of the grading company’s facilities (link). In August 2008, Derby introduced himself to a Nintendo collector forum as the person who helped get VGA running from the very start. “My name is Tom and I’m the contact working on behalf of VGA who researched the company’s entry into the video game market,” Derby said at the time (link). 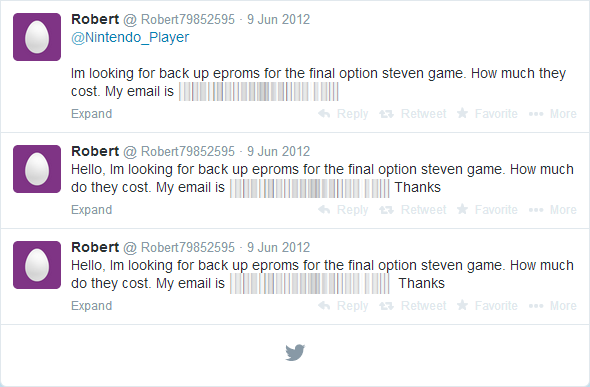 In a January 2008 e-mail on the subject of shrinkwrapped games, Derby confessed his lack of video game expertise. “I am myself no expert on video games specifically, at least not on the level of many of your forum members,” he said to a user of a Nintendo collecting forum. “What I am an expert on is assessing original seals and condition as they each apply to many different types of collectibles. I do, however, have a great deal I could learn from many of the experienced video game collectors out there” (link). 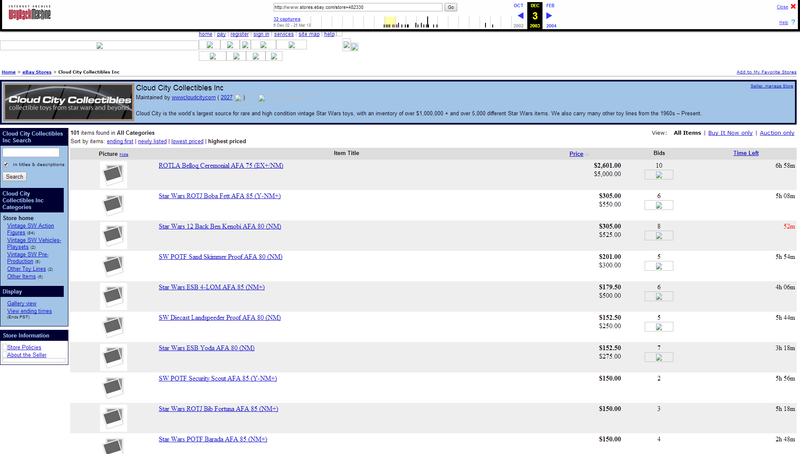 CIB currently sells items under the eBay name “collectibleinvestmentbrokerage” (link). Completed listings show nearly 400 auctions, mostly of AFA-graded toys (link). The store also offers a handful of VGA games such as a sealed The Legend of Zelda in 85 condition for $4,000 (or best offer). 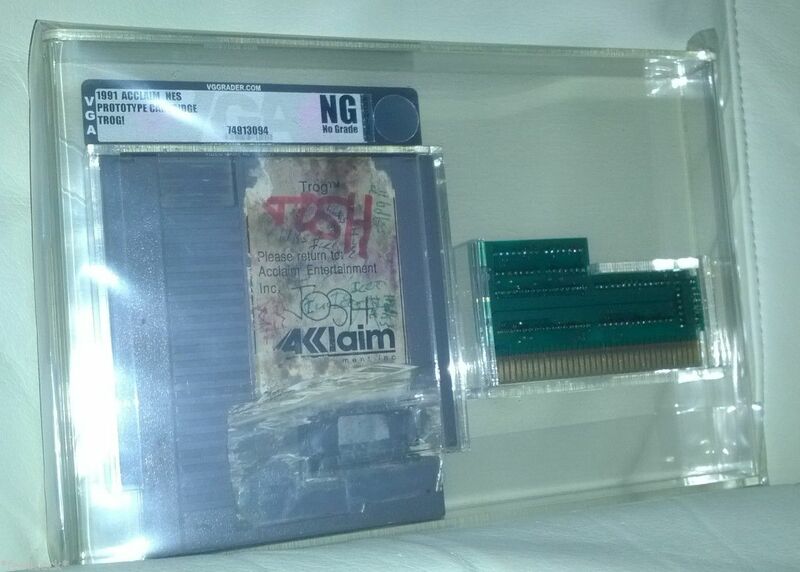 Curiously, the unique VGA serial number on this game matches the serial number on the one listed in Derby’s 2008 Premier Collectible Auctions, which according to the online auctioneer site icollector.com, was sold to a floor bidder for $575 (link). 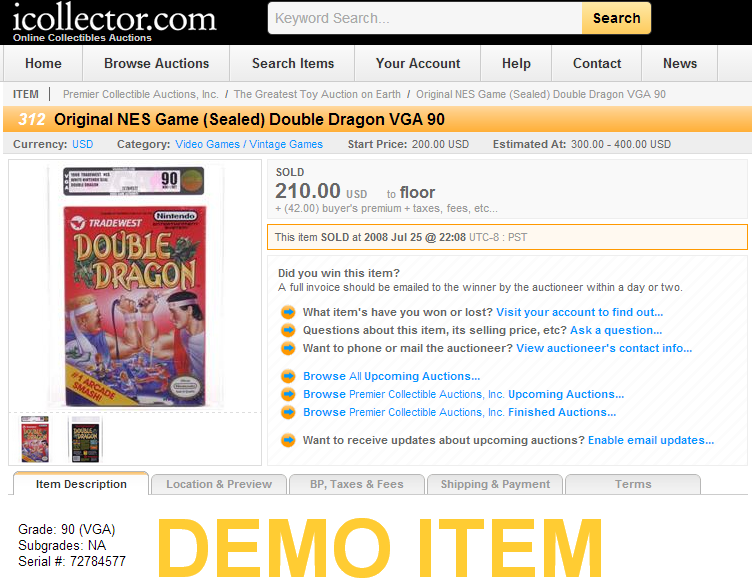 Furthermore, the serial number of a 90-graded, sealed Double Dragon, listed by CIB for $4,000 (or best offer) on eBay, also matches the serial number of one sold to a floor bidder for $210 at the Premier Collectible Auctions (link). CIB’s auctions display the mailing address of a UPS Store in Norcross that matches the company’s current Georgia corporation record, which lists Derby as CEO, CFO, and Secretary (link, link). 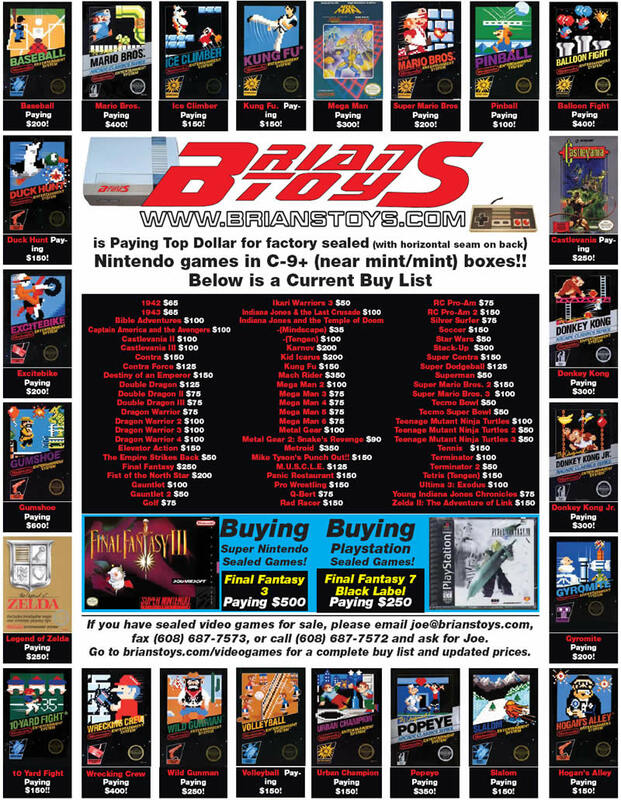 In addition to its eBay Store, CIB runs the domain CollectInvest.com. 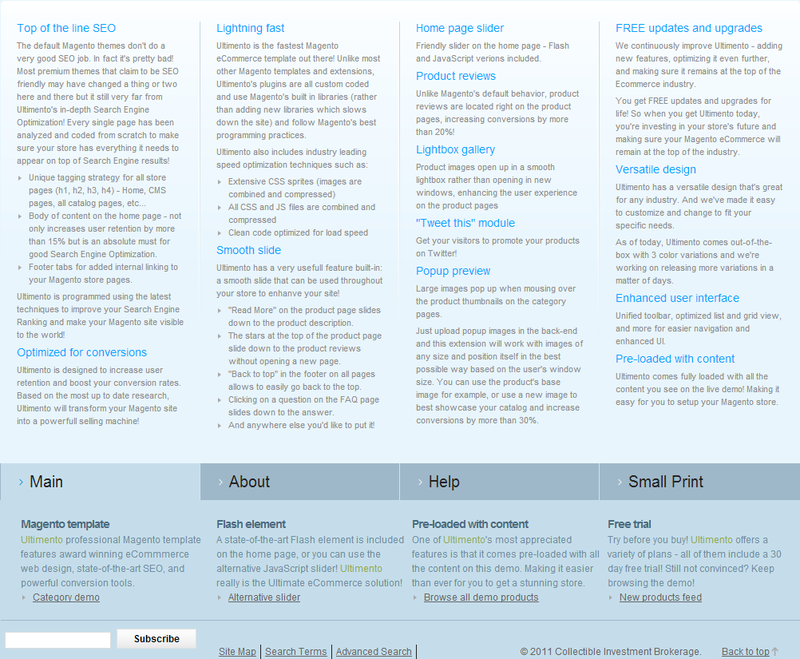 The site appears to use an e-commerce platform template left at its default settings, with large blocks of text on the front page advertising “Search Engine Optimization” and a blurb about a “30 day free trial” for a web theme. Many of the URLs are broken, link to unrelated off-site destinations, or feature more copy about webmaster tools and extensions. “Ultimately, the actual authentication process is by far the least rewarding job I’ve ever had, both emotionally and financially,” he said. Derby continued, “Over the coming months, I will continue to help AFA prepare to provide direct authentication services for certain types of items once CIB services cease to be offered, likely at the end of this year. By applying their extensive training and by utilizing the wealth of information I’ve provided, Senior Graders at AFA will be qualified to authenticate rare production items, various forms of proof material, and most first shots. Authentication of most other pre-production material will fall back on the most experienced collectors in the community (or possibly CIB by special request, not as a published or standard service)” (link). 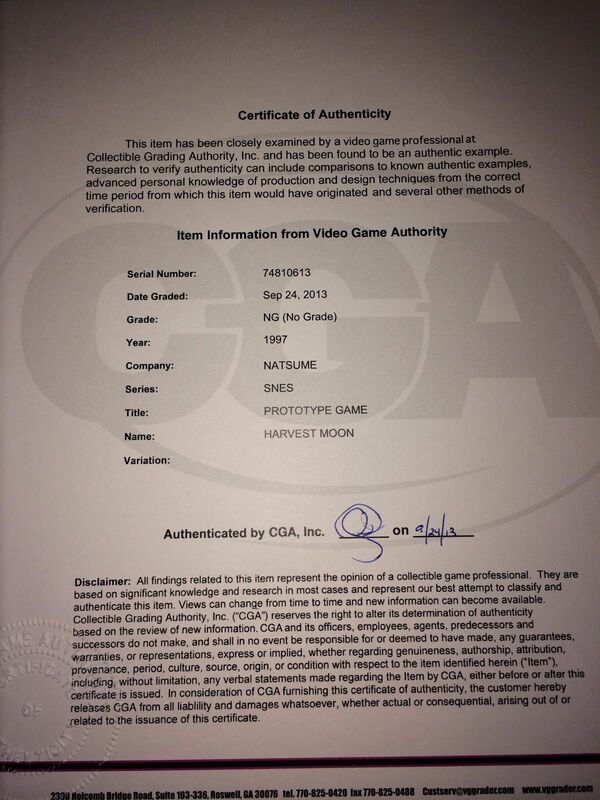 A closer inspection of several VGA prototype certificates of authenticity shows the signature of “a video game professional” at CGA, not Derby’s signature. According to VGA’s Grading Overview page, “Senior Graders” (presumably another name for Master Graders) “typically have five to eight years of grading experience,” while “Junior Graders typically have over two years.” Each item submitted to VGA is checked by two Graders, at least one of whom is a Senior (link). In an interview given to the Spanish gaming site Beta-Zero, Thompson cited “detailed Internet searches” as another tool used by VGA to study submitted video games (link). VGA would not comment on how many submitted video game prototypes actually pass the company’s test. On whether VGA analyzes the very essence of a video game prototype, its digital data, the company would not comment. When questioned about the VGA criteria on what exactly defines a “prototype,” VGA would not elaborate on the company’s step-by-step process. VGA maintained that its answer was due to the individual nature of each of these cases. Its answer was the same when presented with specific problematic examples, such as same-as-final samples, containing retail components, and multiple copies of the notorious, unreleased SEGA Genesis title Sonic Crackers, allegedly reproduced on-demand by an unscrupulous SEGA of America employee. VGA did, however, admit that verifying prototypes was a much more “complex and intricate process” than scrutinizing factory sealed video games. “For Evaluation, Preservation, and Authentication GET IT GRADED” touts VGA’s motto in bold letters, echoed at the top of every page of its website. Grading collectibles as a way to protect consumers from dishonest or incomplete seller-issued condition reports certainly sounds like a worthy service on paper. Who out there hasn’t been burned by a merchant conveniently omitting certain flaws about an item, or having a completely different definition of what the word “mint” means? How about the seller who wields a camera’s flash like a lighthouse beacon, perfectly blinding the one spot where unsightly defects reside? Although the process of grading still remains a subjective one, perhaps a systematic numerical condition scale could provide a buyer with a better idea of what he or she is getting. That might be worth significantly more to someone who is not hesitant about shelling out the extra money required to receive a possibly nicer product, especially when the item is of high value. However, by agreeing to use a “No Grade” system, VGA is admitting that condition is a non-issue in the video game prototype collecting marketplace. Most prototype collectors would probably agree. In fact, if anything, they might say that the more worse for wear, the more signs of usage a prototype shows, the better the chances that the game inside may actually turn out to contain some truly compelling content. Prototypes with immaculate cartridges and neatly composed labels are generally indicative of final or near-final samples sent out by marketing departments to woo over store owners or the press, while the ones that look beaten up and gnawed on–those are the games that if you took a black light to them might reveal some long days and nights of blood, sweat, and tears. The aesthetic value, therefore, comes not from the standard company-issued development boards or the mass manufactured chips; the craftsmanship is wholly virtual as the gaming experience–the extent of the evolutionary changes in the game’s design defines the monetary worth of a prototype in most cases. In other cases, the price is determined by the title’s popularity or historical importance. Either way, it is fair to say that with all video game prototypes, the data trumps everything else. Preservation, therefore, is intrinsically tied to saving that game code. Protection of the physical media comes secondary. Skeptics have argued that a term like “bitrot,” the process by which programmed information stored on EPROMs gradually erases on its own, is thrown around as a scare tactic to get prototype owners to relinquish their games to digital archivists. Whether that is true or not, and those claims are, in fact, exaggerated, is a contested issue among hobbyists. 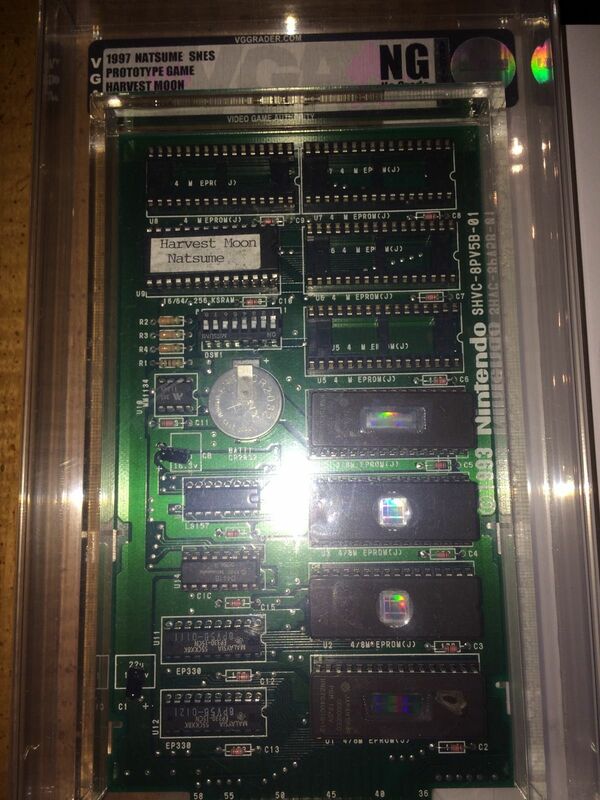 What is known for sure is that EPROM chip manufacturers guarantee a maximum of 20 years of data retention, which already puts many classic video game prototypes past that threshold. If a prototype’s worth is in its game code, as has been shown over and over by how much a publicly distributed prototype ROM image depreciates its original physical source, then not taking the necessary precautions to create back-ups naturally puts that item at risk of losing the bulk share of its value in the long run. Reprogramming the chips becomes an impossibility when there is no conserved data available to be retransferred. By failing to address this fundamental issue of insurance and encasing an undumped prototype while advertising “preservation,” it is difficult to see how VGA is keeping its customers’ vested interests at heart. The third and final pledge that VGA makes is one of authentication. For a potential buyer, the reassurance of having a company research and verify a prototype’s legitimacy may be the most appealing benefit of all. However, despite several attempts for clarification, VGA would not disclose any specific details about how its employees go about authenticating submitted video game prototypes. Its website is equally confusing on the matter. The company’s purported outside expert contacts have not been able to be confirmed, either. While this argument is sound from a free market standpoint, the retort still implies that such a commercial enterprise would be necessary in the first place despite so much free, accessible information online from generous, knowledgeable people a few clicks away. Wilson, who is considered by many to be the single most seasoned collector of video game prototypes with well over a decade of buying and selling them, has also worked in or around the gaming industry under many hats, including Tips & Tricks magazine senior editor, Prima Games strategy guide writer, and Midway Games contractor. He and other prototype specialists like him often frequent gaming forums, and they are known to offer their opinions on prototypes whenever inquiring parties ask–free of charge. The one thing that VGA undoubtedly does provide is name recognition, in that the company falls under the same corporate umbrella as the now entrenched AFA. Wilson and others don’t have official-sounding “brands.” They don’t have incorporated organizations by which to funnel their opinions. They are not part of any marketable entities. And that might be the one catch. The common thread in this investigation is Derby, the figurehead who drove the expansion of grading in the toy and video game markets, whose familial and business relationships laid their very foundations, a man whom Variety once referred to as “the toy industry’s Merrill Lynch” (link). While sifting through his online posts, it was noted that Derby’s username, “CollectInvest,” became almost something of a mantra–an undercurrent running through all his words and through his defense of grading, an omnipresent sales pitch of speculative promises. More than clear plastic or glossy stickers, what the company may be selling to its customers and to the greater gaming community is an investment in itself. If so, the actual authority ultimately lies solely with the almighty dollars of discerning consumers, and the proactive voices of those in the video games hobby. In an attempt at full disclosure, I want readers to know that I first approached this topic as someone whose interest was piqued by the growing number of VGA prototype auctions with high asking prices on eBay. I wanted to learn more about the company, and what made its authentication apparently so valuable. I was taken aback by this request. I expected the company to try to sell me on its already available services. At the same time, I viewed its willingness to learn from other people in the hobby as a positive thing, although I do not consider myself an expert. The majority of this site’s featured development games come from far more prolific collectors. I have what amounts to a few years’ experience as a blogger of these items. That being said, I do not turn people away when they contact me with prototype questions if I can help direct them to more information, or when I spot an obvious fake, I attempt to warn others. It’s something I do fairly regularly, in fact, to part the clouds on this relatively niche subset of game collecting. I also try to be of aid because I realize how dangerous it can be to Google for answers on prototypes. You are at the complete mercy of the Internet, a Cartesian minefield where anyone can say or make up anything. Sometimes, the greater public can mistake a website’s popularity for its truthfulness, indiscriminately believing inept reporting or controversy by the too-often-clickbait media and large user-edited resources like Wikipedia. Other times, smaller fansites can operate more on enthusiasm than accuracy. Even simple published conversations with game developers may lead a researcher astray when the interviewees can be prone to fuzzy memories on decades-old affairs. For as many times as the Internet can be an invaluable encyclopedia, it can just as much be a wasteland of misinformation, rumors, and hoaxes. “I actually already assist people in trying to authenticate their prototypes all the time,” I replied back. It was true. Just a few months before I had agreed to take a peek at half a dozen or so pictures of Nintendo prototype cartridges for a private collector down in North Carolina. On the surface, some appeared to be real, others not so. However, I made sure to communicate my thought process every step of the way so he could see where I was coming from and gain a better understanding of what basic prototype knowledge I could give him. Providing this explanation was much more honest and helpful than simply guessing at each game’s authenticity from over the computer. I empowered him as best I could to make the final determination by pointing out paths that might lead him there and other people who might be able to further help along the way. This is a crucial point to make because, when I go to buy a video game prototype, authentication for me can at times boil down to eliminating as many counterfeit possibilities as I can and weighing the evidence. Sometimes, it can all come down to personal risk taking. 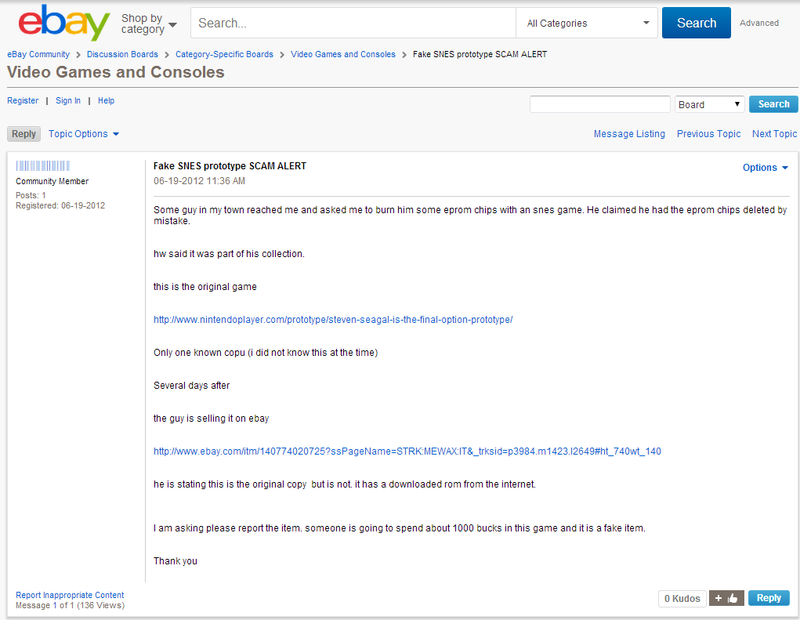 Video game prototype scams do happen from time to time. 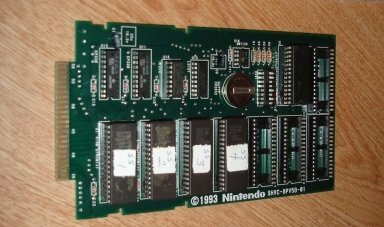 Empty development boards that were once used by developers to test game builds decades ago emerge from the past more often than you might think. A former employee of a large game company that’s now bankrupt told me that he had kept a box full of them from back in the day and asked if I knew anyone who might want one. He said this in the same kind of manner someone might offer a potato chip. These items are out there, and they are relatively plentiful. 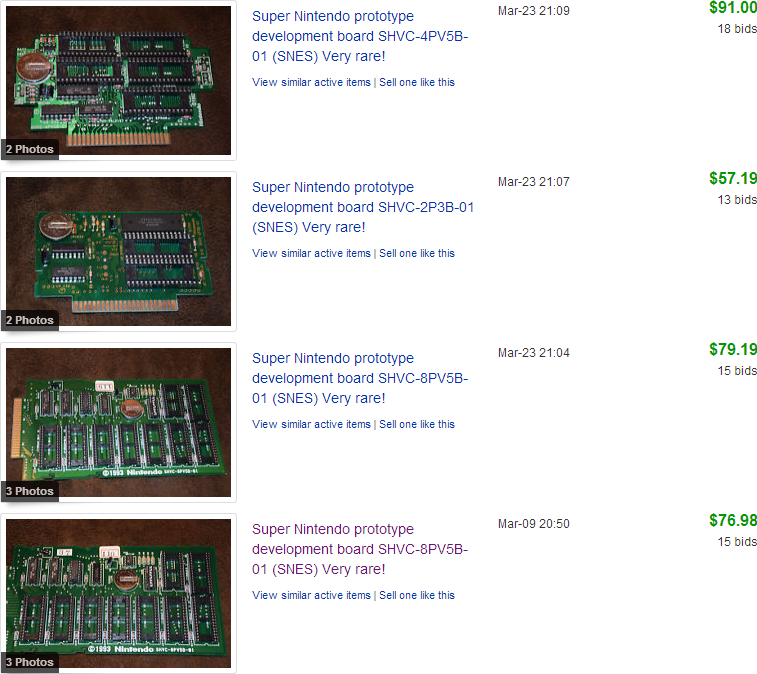 Drawing from my own experience, there was a man in Houston, Texas who won four Super Nintendo development boards on eBay for $305 in May 2012 (link). These pieces reportedly came from the closed offices of Interplay (link). 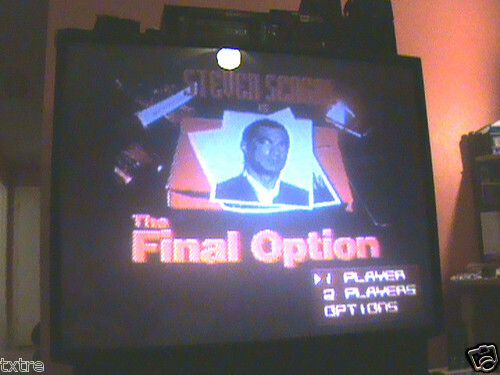 One board happened to be the same type that my Steven Seagal is The Final Option prototype uses. That amazingly hilarious game is a cancelled Super Nintendo beat-em-up. My copy is the only one publicly recorded. When I wouldn’t help him make his reproduction, realizing what opening such a can of worms would likely mean, an individual under another identity found someone local through Craigslist to do it for him. According to the Craiglister, the two planned to meet at a gaming store. The Houston man pulled up in a white pickup truck. 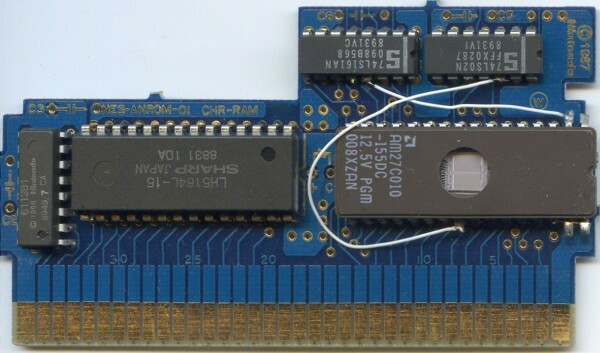 After introducing himself as “Mark,” this man in his mid-30s proceeded to hand over the empty board from eBay, blank EPROMs, and a CD that contained the unreleased game’s binary file to the person from Craigslist, who then took these items home and turned them into a working “prototype,” believing the story he was told about the chips erasing. A day or two later, “Mark” placed the game on eBay, leaving off the fact that he had just arranged for the whole thing to be Frankensteined together. “Mark” then allegedly texted the individual from Craigslist and offered to give him a cut of the final sale if he would help shill bid. Suddenly realizing his part in the scam, the Craigslist reproduction maker contacted eBay and alerted potential buyers on various online gaming forums. “Mark” responded to this campaign by messaging him veiled threats that he was a police officer, according to a saved Google Voice text. Eventually, “Mark” placed even more supposed “prototypes” on eBay, including inserting SEGA 32X chips into a Super Nintendo development board and trying to pass off the impossible combination as a working unreleased sequel to Blizzard’s Blackthorne. He has disguised himself under multiple usernames: “final_boss_nemesis,” “noob-psybot,” “n00b_psybot,” “snakeeyes713,” “txtre,” and “txmarco” (link). If a faked prototype that looks virtually identical to a real one can be so easily put together like that by reusing official parts and burning data downloaded from the Internet, one should never throw caution to the wind and blindly trust the word of a stranger. Otherwise, it is entirely possible to be duped. 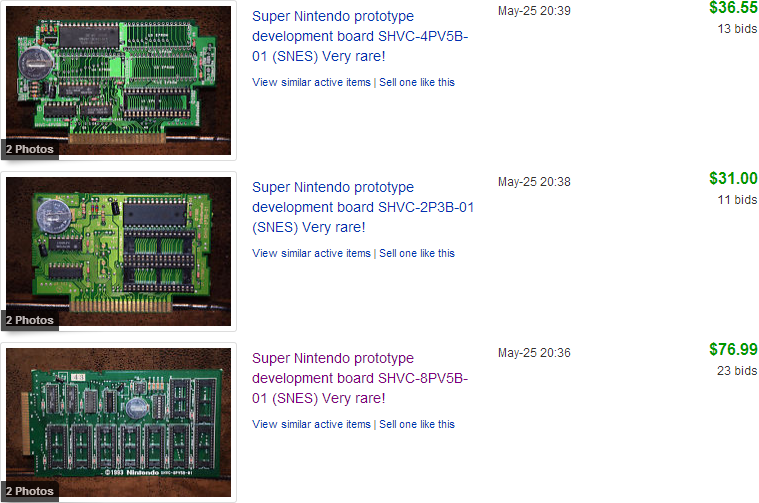 For the record, while writing this article, eight more blank Super Nintendo development boards were observed changing hands on eBay. This problem is not, of course, exclusive to Super Nintendo prototypes. “There’s so little consistency between prototype cartridges, and by the nature of many of them being cobbled together with easily obtainable parts, they’re not difficult to fake,” said Brent “Skrybe” Adams, a longtime Nintendo Entertainment System preservation advocate. Adams also pointed to a Solstice prototype he dumped that uses a re-wired retail production board similar in style to current day homebrew games. 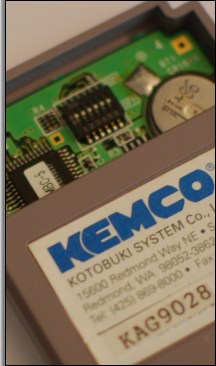 Then there is the difficulty of validating pre-release cartridges that do not contain EPROMs or development boards. 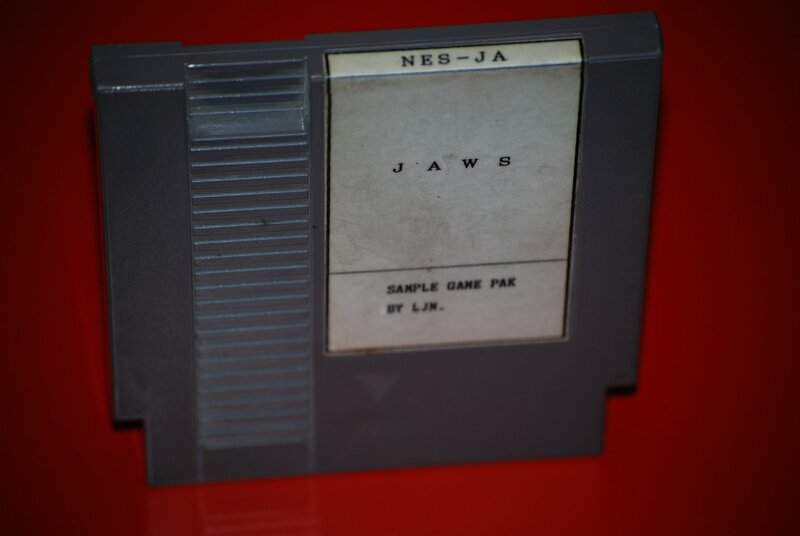 The above photo shows the insides of an authentic Jaws Nintendo Entertainment System sample found in Canada. This picture is a shot of a normal retail copy of Jaws. 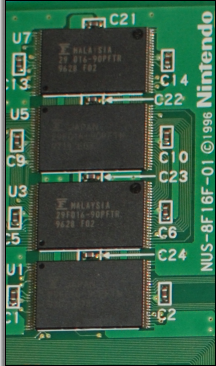 Besides the earlier chip date codes, the only differentiating element about the sample is a thin printed white label affixed to the front of the cartridge. Nintendo prototype labels have been faked in the past, however, using scans of bona fide specimens as their templates, so collectors have to look for other tell signs like age and wear. As you can see, spotting the fakes can be anything but easy, and these are just a few examples. There are many more considerations to be made. I attempted to explain my worries to the company in an effort to again try to get a better grasp on the breadth of its video game prototype verification process and how exactly my input would be factored in and to what extent. This situation was entirely different from what I had done for the North Carolina collector. Now money would be exchanged. Now my words would become a “professional opinion.” Now I would not be able to explain or discuss my thoughts directly with the owner. I still did not fully comprehend how it went about its authentication, and who or what these other “sources” might be. I required much more reassurance. I thought that this might have been a customer service issue, so speaking directly to a higher-up like Thompson would clear things up on the lack of disclosure. After making that request, however, I never heard back from the company. I tracked down Thompson’s e-mail address through VGA’s public Whois record (it is the same as the one found on AFA’s most recent 2014 annual Georgia corporate registration) and attempted to directly contact him. Later on, I also tried reaching out to Derby through his CIB e-mail. Sometimes not answering is an answer in itself. Other times, that is not enough. I have always been passionate about consumer issues, particularly as they relate to my own personal hobbies. If the company had not left my queries unanswered while suggesting at the same time that I somehow advise it, this article would not have been written because I would not have been provided the motivation to dig deeper. That the majority of this article is essentially a compilation of message board posts instead of meaningful back-and-forth dialogue is not my fault. This investigation is an effort to piece together the fragmented puzzle that is VGA’s history, operations, and policies to better inform game consumers. The conscious decision to support or not support VGA goes beyond the simple notion of “voting with your dollars,” however, for the stances we take may hold greater consequences for the hobby and video game preservation, and affect things much larger than what can fit in the bottom of our pockets.